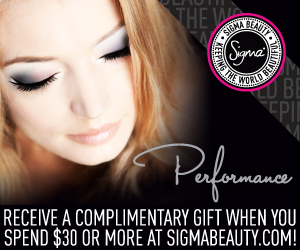 Sigma Beauty Affiliate Program: NEW Performance Eyes Kit! We are extremely excited to introduce another unique Sigma Beauty kit! The Performance Eyes Kit was designed for precise application of liquid, cream and powder products onto defined areas of the eyes. The kit features 8 brand new brushes: E11 Eye Liner, E16 Tightline Liner, E17 Waterline Liner, E21 Smudge Brush, E36 Blending, E46 Shader – Inner Corner, E47 Shader – Crease and E56 Shader – Lid. The Performance Eyes Kit has been thoroughly tested to ensure quality brushes that are functional and easy to use. Each brush is an original design and available exclusively at Sigma Beauty! Share this information with your followers within the first week of the launch to boost your sales! Updating your blog with one of these new banners is a great way to introduce your followers to the new kit. Simply save the image to your computer, upload it as a picture to your blog, and insert your affiliate link as the website! The Performance Kit is a great addition to any makeup collection. Useful for beginners and professionals alike, the kit is perfect for creating elaborate makeup looks. Unleash your creativity! For more information about the Performance Eyes Kit, click here! Whoever designed the banners did an AMAZING job! Hi Kelly! We are not releasing a horizontal banner for the Performance Eyes Kit at this time! It's on my blog with an article about ! Love it! Want it for myself. Me encanta este nuevo diseño, es precioso. Amazing! Oh my god, i can't choose one, i want them all! I put on my blog, it seems perfectly!!!!!! Can't wait to have this! Sou afiliada e tenho um blog que está chegando aos 1.000 seguidores. Como faço para solicitar o brinde? Tem algum formulário ou ele é enviado automaticamente? At this time we are no longer sending products to affiliates through the Incentive Program. However, all active affiliates who are earning money will benefit not only from their 10% commission, but also through our Rewards Program: http://sigmabeautyaffiliates.blogspot.com/2012/01/updated-sigma-beauty-rewards-program.html. Thank you!